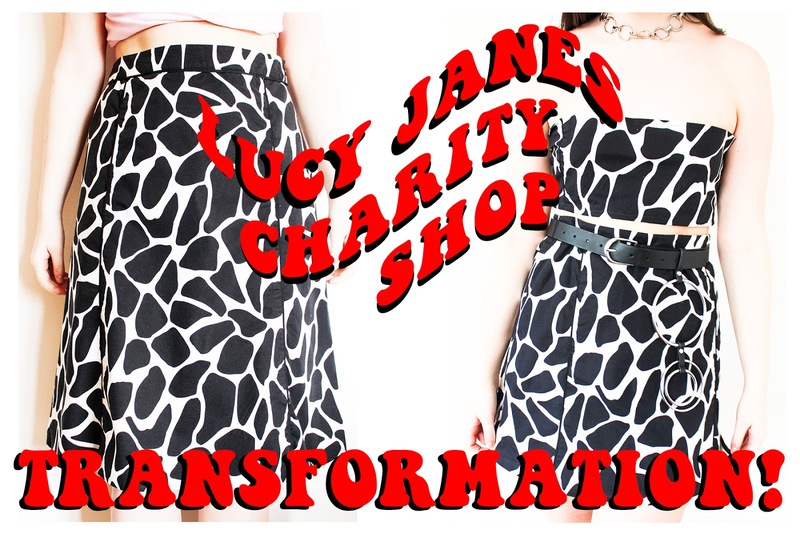 Charity Shop Transformation: £1 cow print skirt into animal print two piece!! Well yes, that's because it pretty much is but you have to look past that and think how YOU could make it your own. From turning skirts into two pieces, tops into crops, I want to show you how things that look awful on the hanger can be changed into something stunning! It's more sustainable, its cheaper and you're money goes to a good cause so get transforming! Today I'm going to tell you how I turned this £1 Grandma style midi skirt into a Motel inspired two piece. As I said, I picked this item up for £1 meaning that if things did go wrong when transforming it, I hadn't really wasted my money on trying. I instantly went to this skirt because of the cow print. 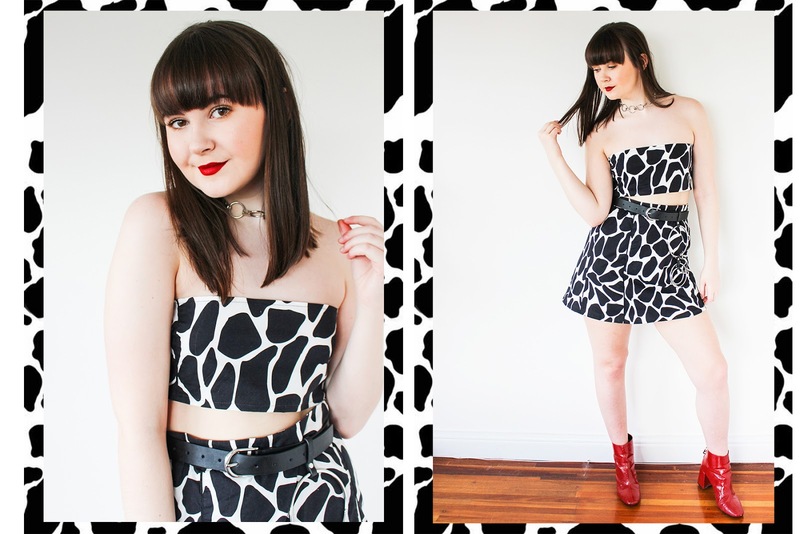 I'm a true lover of animal print and cow print is about the only print I don't actually own! I'd seen sets on Asos/Motel for £50+ so decided I might as well have a go at making one myself. To start of with I cut the skirt with sharp scissors (blunt ones may create a messy line) to my desired length following the circular shape of the skirt. I allowed myself enough extra material so I could turn it under and hem so the edging along the bottom was neat. Once it was cut, I pinned under the material to my desired length and tried it on. Always make sure to pin and try on before sewing, it may take longer but its so much more accurate. I then sewed the material with a straight stitch along the hem to create a neat edging and the skirt was done as simple as that! As I had cut material off the skirt, I decided I had enough fabric for me to create a bandeau top. To make the top I took the material I had cut off the bottom of the skirt and cut it in half so it became one lone strip rather than a circle. I then pinned the horizontal edge which wasn't hemmed into place and tried it on, once right I sewed the hem with a straight stitch on the machine. After that all I had to do was hem the edges where I'd cut it vertically and that was it! In order to fasten the top I decided a tied back was the simplest but you could get a zip or some buttons if you fancied something different. It really wasn't a difficult process and anyone with access to a sewing machine could definitely do exactly what I did. You just have to think creatively and have a vision of what you want it to become. I turned a £1 skirt into an amazing two piece that I'm sure will be turning heads when I wear it this summer! I hope this inspires you to do some Charity Shop Transformations and I'd love to see them if you do! I freaking love the results!! I love DIY projects and this charity shop transformation is awesome. I'm a big fan of vintage/second hand/ charity shops, so I can totally see myself trying this one. I have a few skirts in my closet that are a big too big for me, so I might give it a try. You look like a million dollars girl! This two piece set looks phenomenal on you. How cute is that co-ord! You're so talented!